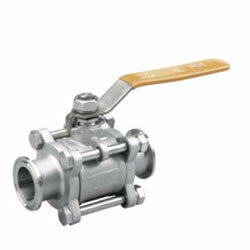 The pipe thread of this carbon iron ball valve can conform to NPT, BSPT, BSP, ISO-228 Class A Thread. The nominal pressure can be 1000PSI (PN63) for 1/2" to 4". The stem adopts blow-out proof materials. And the locking device materials of this three-piece T-Clamp sanitary type ball valve can be CF8M (DIN 1.4408), CF8 (DIN 1.4308), WCB (DIN 1.0619). The temperature range can be PTFE: -20℃~180℃, TFM: -50℃~270℃, RPTFE: -35℃~210℃. This 1000 W.O.G. three-piece T-Clamp sanitary type ball valve can be used as cutting off or connecting medium in all kinds of piping. The suitable medium for this three-piece T-Clamp sanitary type ball valve can be water, oil, air and some corrosive liquid (W.O.G).